The distance from the mouth of the river to the ram was about 8 miles, the stream averaging in width some 200 yards, and lined with the enemy’s pickets. A mile below the town was the wreck of the Southfield, surrounded by some schooners, and it was understood that a gun was mounted there to command the bend. I therefore took one of the Shamrock‘s cutters in tow, with orders to cast off and board at that point if we were hailed. Our boat succeeded in passing the pickets, and even the Southfield, within 20 yards, without discovery, and we were not hailed until by the lookouts on the ram. The cutter was then cast off and ordered below, while we made for our enemy under a full head of steam. In a moment we had struck the logs, just abreast of the quarter port, breasting them in some feet, and our bows resting on them. The torpedo boom was then lowered and by a vigorous pull I succeeded in diving the torpedo under the overhang and exploding it at the same time that the Albemarle‘s gun was fired. A shot seemed to go crashing through my boat, and a dense mass of water rushed in from the torpedo, filling the launch and completely disabling her. Completely exhausted, I managed to reach the shore, but was too weak to crawl out of the water until just at daylight, when I managed to creep into the swamp, close to the fort. While hiding a few feet from the path, two of the Albemarle‘s officers passed, and I judged from their conversation that the ship was destroyed. 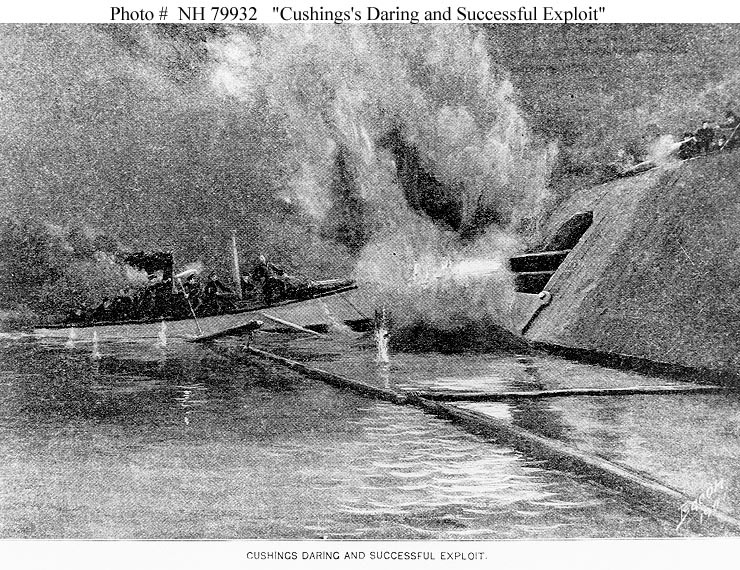 As a naval officer, Lieutenant Cushing was ineligible for the Medal of Honor. He received the Thanks of Congress for this action. This entry was posted in Civil War Events, Navies and tagged CSS Albemarle, Lt. William Cushing, Plymouth. Bookmark the permalink.